In South Africa, the not-so-quick and the dead. There’s a crisis in South Africa’s mortuaries – in the investigation of death. 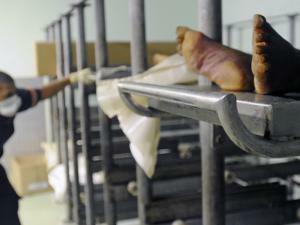 For the Western Cape alone, 3,000 bodies are handled by this Mortuary each year. Of this number, 65% are unnatural deaths (accidents, suicides, homicides). Of that number (approx 2,000) a staggering 80% are homicides – in other words, Salt River is responsible for providing the forensic evidence for reconstructing the crime scenes leading to 1,600 murders a year. Watch the ten minute film here. The view room is very impersonal. We’ve tried to make it look better. We deal with a lot of family members. Sometimes they are so traumatized they pull the curtains down and try to get access to the deceased. Mortuaries need both forensic pathology, which determines the cause of death, and forensic science, which provides DNA and toxicology results. At the moment, it can take the pathologists anything between two to eight years to determine a cause of death, formulate their opinions, finish it off, sign it off, hand it over to the inquest magistrate or the criminal court. This is work that should be done within a week. Delays at the forensic laboratories alone mean that families can wait up to 8 months just to identify a body. In other parts of South Africa, notably KwaZulu Natal, bodies have been backing up due to strike action at mortuaries and at local state hospitals after “disgruntled” mortuary staff down tools, yet again, in protest against “unhygienic and stinky” working conditions (Daily News, February 2013). It’s worth taking a step back to look at the fundamental requirements for imposing a duty on the state to investigate death in this country, under the European Convention of Human Rights as interpreted by Strasbourg and incorporated by the Human Rights Act. The duty to investigate is usually triggered when a person dies in prison or in care. So where a patient, detained in hospital under Section 3 of the Mental Health Act 1983, takes their own life, Article 2 imposes procedural obligations on the State to investigate the circumstances of the death. These obligations are fulfilled by a coroner’s inquest: see R (Antoniou) and Ross Beaton’s earlier post on that case. If someone dies either by their own hand or by suspicious circumstances in prison or a police station, there may need to be an independent investigation system prior to the inquest stage R(Amin) v Secretary of State for the Home Department, R(L) v Secretary of State for Justice, and R(Smith) v Oxfordshire Assistant Deputy Coroner. But sometimes the Article 2 procedural obligation to hold an “effective investigation” is satisfied by an inquest. This is all established law, where the state is involved. What the South African story spurs us into asking is, what are the minimal duties outside the state-agent/state-institution death? In Antoniou it was argued that there are two procedural obligations on the State when an individual dies, which are owed to the next of kin on behalf of the deceased and to them in their own right. The first duty is to establish and operate an effective independent judicial system so that the cause of any death can be determined and those responsible made accountable. The procedural obligation under Article 2 to investigate requires the state”…to initiate an effective public investigation by an independent official body into any death occurring in circumstances in which it appears that one or other of the substantive obligations of the state has been or may have been violated and it appears that agents of the state are, or may be, in some way, implicated“. Does that mean that in the absence of agents of the state – say where the death occurs outside the confines of a prison, immigration or a mental health institution, these procedural obligations fall away? Taking the question further, and relating it back to the plight of those South African families whose relatives have fallen victim to crime, is the state under no procedural obligation to investigate the causes of death and to find the perpetrator if, say, someone is killed by a hit and run driver? Maybe such a point has not crystallised in a claim, because in this country the post-death procedures are not set about with the difficulties faced by the autopsy and forensic pathology arrangements in South Africa. But the procedural obligations of the state where death occurs beyond the reach of state agents or institutions cannot be nil: they must involve the basic duties of the relevant entities to provide facilities for identification, and, where necessary, to establish the cause of death by autopsy and the circumstances leading to unnatural death by forensic pathology and identification of suspects. Happily, at the moment, this does not appear to be in issue. But we should be vigilant about how those investigating death are properly funded to do so, and not regard it as something that can be dwindled back by cuts against state bodies.